A direct-drive rotary stage with extremely large aperture and high load capacity provides higher speed and accuracy than similarly sized worm drive stages. 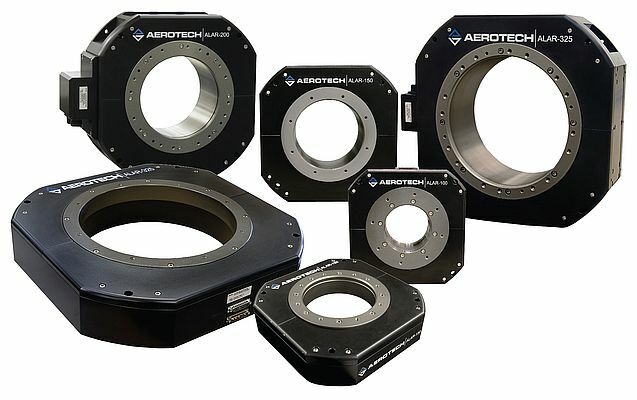 Featuring smooth non-contact drive, the ALAR series from Aerotech eliminates the wear that is inherent in gear-drive stages. Available in five aperture sizes of 100, 150, 200, 250 and 325mm, the stages boast an axial load capacity of 595kg. Their operating speed of 45 to 300 rpm is significantly higher than gear-stages of comparable size. The stages can be configured as multi-axis gimbals. Models are available for vacuum testing to 10-6 torr. Angular contact bearings maximize performance with respect to tilt error, moment stiffness and rotating friction. Working especially well in applications that require 360° continuous motion but have limited space, the stage is 65 to 160mm tall and provides smooth motion without travel restrictions. Featuring no brushes to wear, no gear trains to maintain, high acceleration, and high speeds, the motor’s slotless design ensures zero cogging that eliminates torque ripple.